Built in 1852 by Nicolas Larco. LARCO, Nicola (Nicholas) (1818-1878), a Genoese who established himself in San Francisco in 1849 as a prominent import-export commission dealer in groceries, coffee and liquor. Larco also owned a fleet of commercial vessels which operated regularly between Mexico and San Francisco, and soon became the leading Italian merchant of the Pacific Coast. 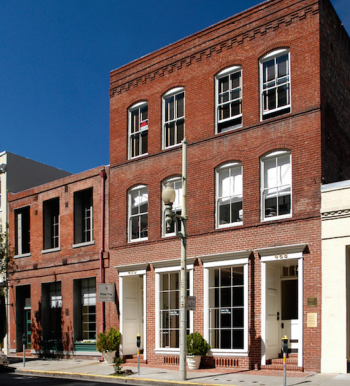 He and his wife, Carlotta, lived next door to the Caires on Telegraph Hill in the 1850s. In 1852 he constructed the Larco Building at 470 Jackson Street, east of Montgomery, on a 60 x 55 foot lot (Assessor's Block 175; Lot 10) where his business, N. Larco & Co., was located until 1877. In 1856-1857, Larco was consul for Chile in San Francisco. According to the San Francisco Assessor's List of 1857, Larco was worth $35,000. October 17, 1858 Larco became the first president of the Italian Mutual Benefit Society (Societa Italiana di Mutua Beneficenza), organized for humanitarianism and ethnic solidarity. He also was a founder of the Italian Hospital Association. In 1859 Larco was treasurer of the Fund Drive for the Poor Families of the Italian Army to which he personally contributed $100. Larco served as treasurer. Larco died in San Francisco on March 12, 1878 at the age of 60. He and his wife, Carlotta, had no children. He allegedly died penniless. 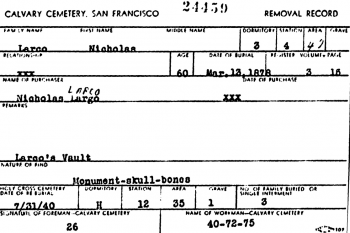 When the remains of some 40,000 graves were removed and relocated from San Francisco's Catholic Calvary Cemetery, Larco is though to have been transferred to burial in a large unmarked mound in Holy Cross Catholic Cemetery, Colma, CA. This page was last edited on 2 March 2016, at 23:15.